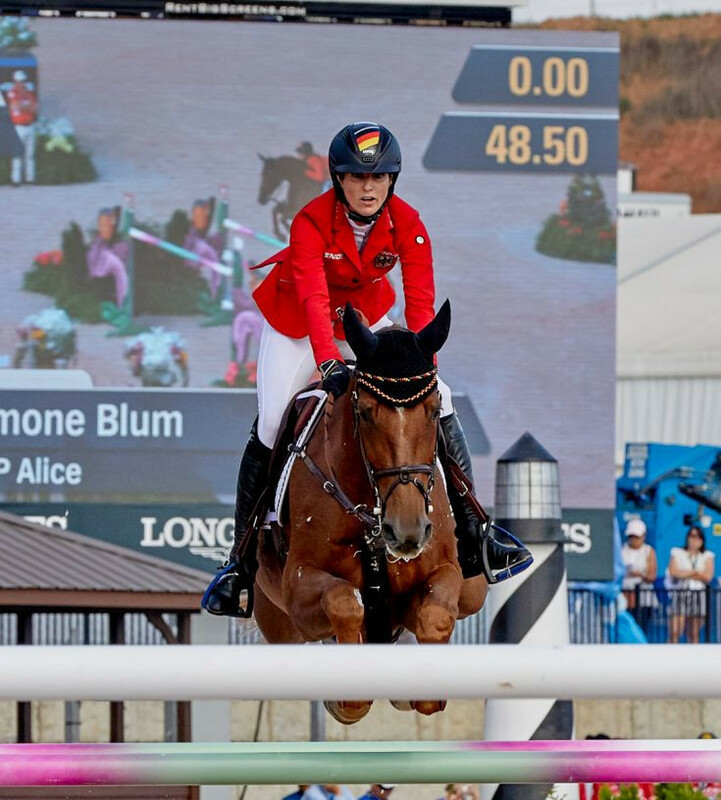 Simone Blum of Germany became the first woman to win the individual jumping title at a World Equestrian Games, finishing five rounds without a single fault on her horse Alice in Tryon in North Carolina. 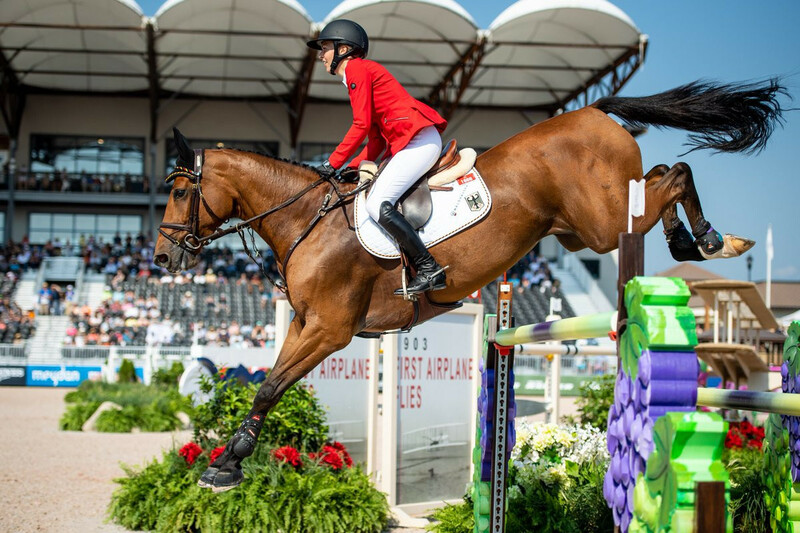 The 29-year-old from Freising, whose father Jurgen represented Germany in eventing at the 1996 Olympics and won a European bronze, was the final rider to go in the US Trust Arena. She jumped clear with a one-point time penalty, her only penalty over five rounds of competition, for a total score of 2.47 points. It capped off a dominant performance from the German, who had led the event since day one. The silver medal went to Martin Fuchs of Switzerland, who jumped clear in the final round but accrued two time penalties for a total of 6.68 points. 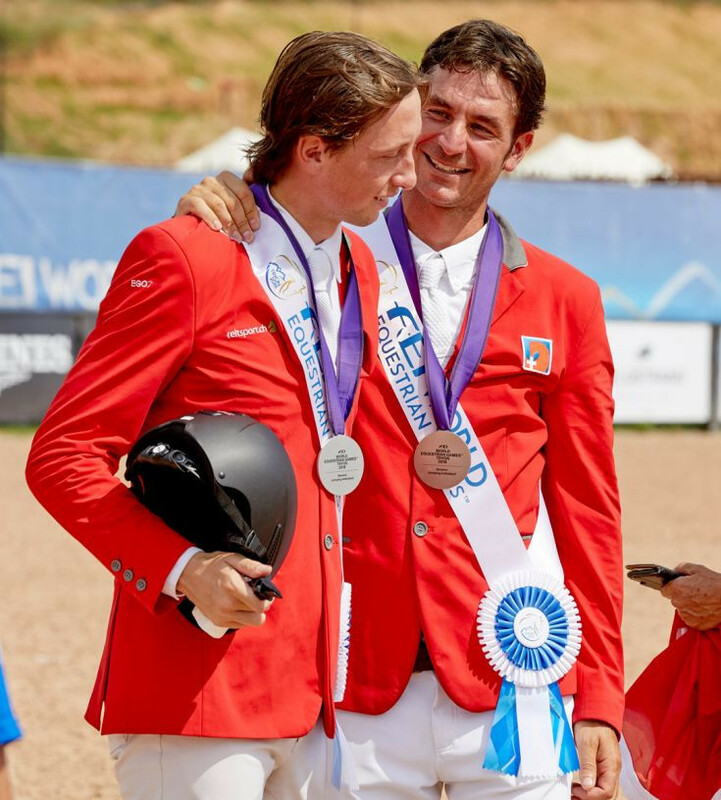 Bronze went to Fuchs' Swiss teammate, Rio 2016 champion Steve Guerdat, who was the only rider to jump completely clear with no time penalties in the final round, for a final overall score of 8.00 points. These were the first individual medals for Switzerland in this event since 1990. "This was a perfect day,” said Blum. “Alice jumped great for the whole week, she had no fault in five rounds of competition, she was unbelievable! "She has the biggest heart and I think this week she knew that she could win the hearts of all of the sport - she really wanted this win today." The final day of the jumping featured two rounds of competition - each with a different course - with only 25 riders from the original 124 involved, and only 12 advancing to the final medal round. Penalties were carried forward from the previous days’ competition. Blum led into the medal round from Max Kühner of Austria and Fuchs, with Guerdat fourth ahead of Lorenzo de Luca of Italy and Laura Kraut of the United States. Carlos Enrique Lopez Lizarazo of Columbia was the first rider to go clear, with just one time penalty, and had the crowd on their feet cheering. His lead was short lived, however, as McLain Ward, whose decisive final round had secured the team jumping gold for the US two days earlier, followed him with another clear ride that was one second over the time allowed, for 11.08 points to Lopez Lizarazo’s 12.81. Kraut’s final ride saw her finish with 18.87 before De Luca moved up to third with a final total of 14.19. Guerdat’s perfect ride meant he stayed on 8.00 points and became the new leader. He was soon replaced by Fuchs, whose clear ride with just two time penalties established him at the top of the leaderboard with 6.68. Kühner was unable to maintain his position, finishing on 12.97 points, with two fences down and a time penalty, to go out of medal contention. The crowd was silent as Blum began the final ride of the day - and she delivered once again. In the driving event, Australia’s Boyd Exell, overnight leader following the dressage and marathon disciplines, secured overall gold in finishing second in the concluding cones test behind Bram Chardon of The Netherlands. Exell finished with a total of 154.14 points, with home competitor Chester Weber, third in the cones event, taking silver with 163.38 ahead of Belgium’s Edouard Simonet, who scored 174.15. Weber’s efforts – along with those of James Fairclough and Misdee Wrigley-Miller - helped the United States take team gold with 353.39 from The Netherlands, who finished on 356.79, and Belgium, whose final total was 364.09.